To the disappointment of many students, the opening of Panera Bread, the newest addition to the Johnson Center, has been postponed. “At this time it is anticipated that Panera will start training January 5th and open in time for spring semester,” said Mark Kraner, executive director of campus retail operations. Kraner explained that the contractor working on Panera did not meet the schedule, but students can expect to order their soups, salads and sandwiches upon returning from the holiday break. However the campus Panera store is a corporate company so Kraner says they have not indicated that it will be different from any other location. This leaves many students angry, even if Panera Bread would not have been their first choice for dining. As construction for the new bistro continues to move along, La Patisserie (La Pat) will remain open. La Pat will close shortly before the opening of Panera Bread and that space will be converted to a Mexican-style concept in the future. The Mexican dining area will be short term, according to Kraner, until summer 2016 when the west side of the JC is remodeled. 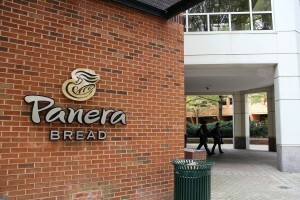 Panera topped the list of student requests several years ago when the planning for retail renovations commenced, Kraner noted. It will be the company’s first “inward facing” store where the majority of business is from the campus rather than the public. Kraner says other Panera locations on college campuses are typically more urban and exterior to attract outside business. The location will not accept meal plans but will take Freedom Funds, Bonus, and Mason Money. Even though there are frustrations over the delay, some students say that it will not change their decision to visit Panera when it opens in January.